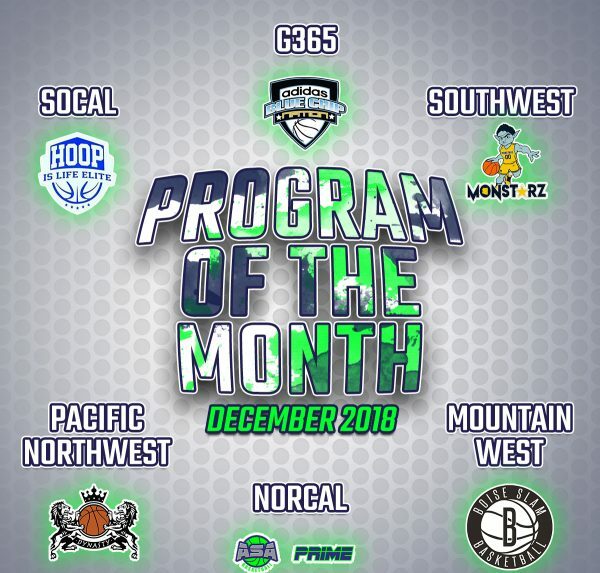 Anaheim, CA– AZ Blue Chip Nation today was named Grassroots 365 Program of the Month of December, and Hoop Is Life, AZ Monstarz, ASA Prime, Boise Slam, and Dynasty Elite were selected as winners of their region’s honor. The AZ Blue Chip Nation program has had a terrific G365 circuit start as both their 14U and 13U teams have earned a G365 Top 25 Ranking. Their 14U team is currently ranked in the G365 Top 10 and is the top ranked Southwest team after defeating Give N Go at the G365 Phoenix Classic. The 13U team is currently ranked as the #3 Southwest team. The 14U AZ Blue Chip Nation earned a coveted top seed at the OGP Championship taking place in Anaheim, CA on April 5-7. The Hoop Is Life program continues to produce competitive teams at the 8U-10U divisions. The program has had multiple championships, been on the list of top offensive and defensive teams, as well as placed several players on the G365 All-Tourney list. We expect the program to be a strong representative for SoCal at the OGP Championship Event on April 5-7. The AZ Monstarz program have two teams on the G365 Top 25. The 12U team is in the G365 Top 20 and ranked 3rd in the Southwest division. The 11U team currently sits at G365 #6 and atop the southwest division. As the top ranked team in the Southwest, the AZ Monstarz earned one of top seeds at the upcoming OGP Championship event on April 5-7. The ASA Prime program currently has four teams on the G365 NorCal Top 10. The 10U team recently took home the G365 Bay Area championship behind MVP Zion Grissom. The 13U team has had competitive team in a tough 13U NorCal region. The team is led by recent EBC West MVP, Kasen Krueger. The Boise Slam program made its G365 debut at the recent G365 Portland Classic. The program has two very competitive 14U team with one earning a top 5 MW region ranking after placing 2nd against the top ranked 14U Dynasty Elite team. Boise Slam will be at the upcoming G365 Salt Lake City Classic. The Dynasty Elite program has taken over the G365 top ranking in the 14U division after an impressive championship performance at the G365 Portland Classic. In addition, their 12U recently made its G365 top 25 debut after also taking home a championship at the G365 Portland Classic. The 14U team will be the top ranked team and seed at the OGP Championship event on April 5-7.